iTunes store carries million of application for iPhone which are truly remarkable for respective purposes. The slogan of iPhone is very well proved " There is an app for that". Now, if you you are the owner of this ultimate peace of gadget and want to carry some best islamic application then what iTunes have for you? So here i listed some of the application which i use for various purposed and are available free on app store. Some of application do have a pro copy but till now i didn't feel to buy the one. The free copy are more than sufficient to fulfill my needs. Now let me take you to the point and suggest the applications. iQuran - The Guided ways provide best Islamic application on mobile devices and here they built an application called iQuran. The GUI is good for reading. You can browse through the aayat and bookmark it for further reading. if you are connected to the 3g or wi-fi you can listen to the recitation and there are more to explore. 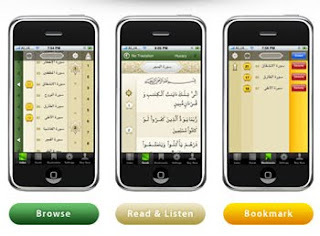 alQuran - Another Quran application on iPhone. You can read Arabic as well as english translation simultaneously. Having complete recitation but u need to download it. Got stunning GUI. I still need to explore this more. Maktoob dictionary - This is an arabic dictionary for you. Type the english word and this will convert it in arabic for you. iPray - This is used to remind you about the prayer time across the location on earth. Islamic cal - This is lunar calender with comparison of gregorian. So when you want to see what is the date today as per the lunar calender against the gregorian just go through it. It also provides the information of Islamic events. Qudsi - This is not so huge application but it does have some hadith built in it and gets updated time to time. so you can read through it when you feel like. So here are my recommendation for Islamic application on iPhone which i use and found worth for my iPhone.